Spread the bread slices with the salad dressing. 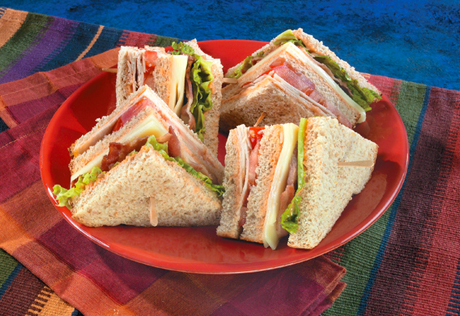 For each sandwich, layer 1 bread slice with 1/4 of the turkey, 1/4 of the tomatoes, 1 bread slice, 1/4 of the cheese, 2 bacon strips, 1 lettuce leaf and 1 bread slice. Secure each sandwich with 4 toothpicks. Cut the sandwiches into quarters.